A western bottle of mystery no more, or is it still. 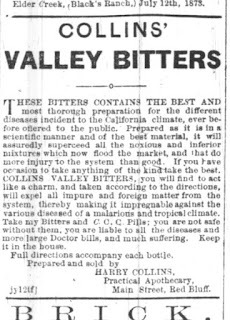 Before the labeled Collin's Valley Bitters was discovered, the bottle which the label was on had been a mystery for a long time. There has only been a hand full of these bottles found over the years. Mostly from the Northern Sierra foothills ( Gold Country) The two in the pic. the amber one was found by D. Bell in the foothills and the yellow one I found in mining tailings in the foothills. The labeled one I discovered in an antique shop in downtown Roseville in 2003, putting the connection of where the bottle was from finally. Yahoo, its western! 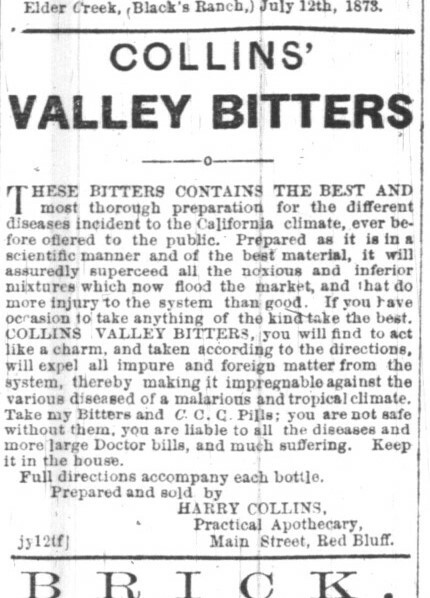 The label reads; "Collin's Valley Bitters" A perfect tonic, prepared by, Harry Collins apothecary. 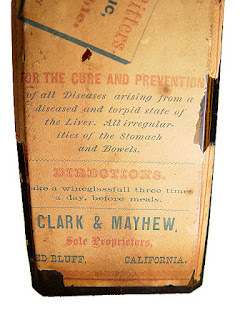 Clark and Mayhew sole prop. Red Bluff, Cal. The connection with these bottles is the uniqueness in which the bottle was made. Not only in shape but the repairs to the mold that you can see on the bottles. There is 3 repaired areas on 2 edges. Two on one edge and one on another. (see pics) The amber ones repairs are more crisp than the yellow one and the labeled one. Showing the long use of the mold. Strange that the amber one is plain with almost no character to it at all with crisp repairs, while the other two are much cruder with weak repairs. I have seen these in some nice colors, even green and they all have those repair marks. Now with that said, who, where and when was the Collin's Valley Bitters born. Well all I could find out was, the C.V.B was put out by Clark and Mayhew from Red Bluff, Cal. 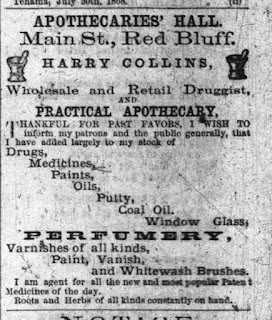 They are listed as general merchants and the only ad for C.V.B. was in the Red Bluff Independent July 12, 1873 and June 27, 1874. 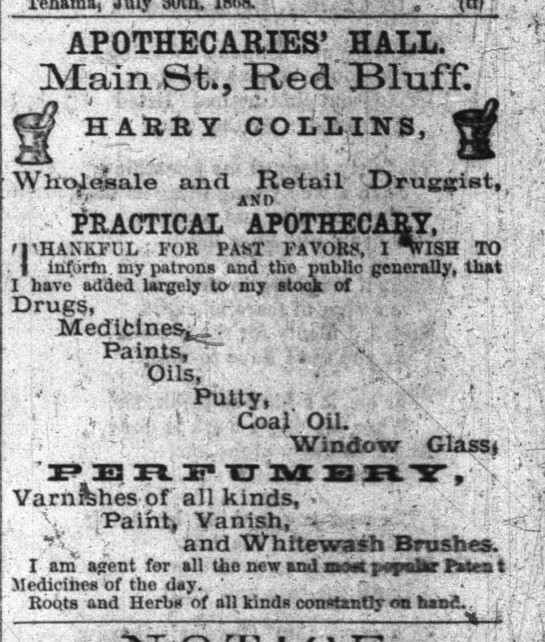 That says prepared and sold by Harry Collins Main St. Red Bluff, Cal. 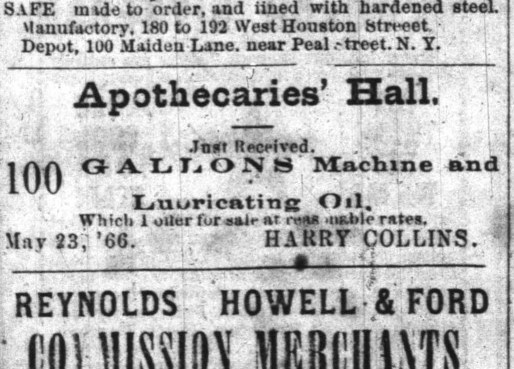 This is the only reference of Harry Collins I could find selling his bitters. No other ads are listed. A very short lived western bitters. The last great mystery is where was this bottle made. It is unique with its repair marks and shape. There is however the T.M. with star bottle that is the same shape and age, but with no repair marks and is very western. These Collin's bottles only come from a small area in Nor Cal. It is hard not to believe its western made, but by whom. A bottle short lived like the Collin's Valley Bitters. That repair is very similar to the repairs on the small letter Renz bottles also. Very interesting research. Great post Mike! I have dug two of the CV squares, with one being a light grass green...Imagine if these were embossed!!!! Thanks Dale, An embossed one would be awesome. I remember seeing your green one at an Auburn Show some years ago. I have an amber one. I thought it was different because of the mold repairs. Is there any proof that they were made just for this bitters? They could have sold the glass to anyone who wanted to put a label on it.